According to legend, Pele protects her sacred fires today in Halema‘uma‘u Crater at the summit of Kīlauea Volcano on Hawai‘i Island. Halema‘uma‘u means “House surrounded by the ‘ama‘u fern,” referring to the ferns that surround the volcanic crater. These ferns are said to be the embodiment of the demi-god Kamapua‘a, who pursued Pele’s love but was rejected. 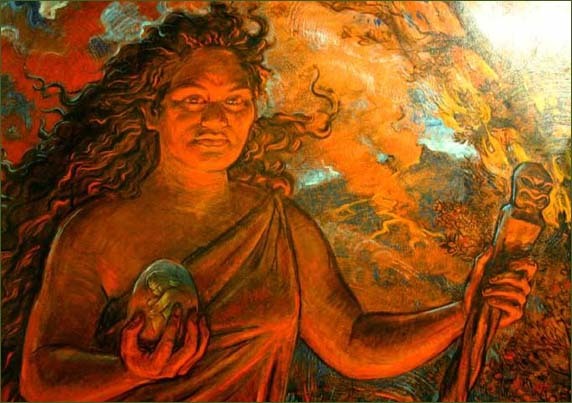 The battle between Pele and her sister continues today on Hawai‘i Island’s southeast coast where the lava meets the sea in fiery explosions. In ancient Hawai‘i, the fruiting branches of the native ‘ōhelo were thrown into Kīlauea Volcano as an offering to Pele. Another plant considered sacred to the goddess of fire and volcanoes was ‘ōhi‘a lehua.